One of the worst experiences is listening to a non-educator telling a teacher what they should and should not do in their classroom. If you are going to train teachers, you should have experience with instruction. Have you ever sat in a 3 hour PD where the speaker read each line of their 175 slide presentation of text verbatim? then included images that weren’t relevant to the slide, and animation that made you dizzy? nah me either. Sit and Get PD where the participants never get the opportunity to try it. No opportunity to play with the tools, and explore. This is really powerful for kinesthetic learners. The speaker does not engage the learners. No opportunity for discussion or collaboration. Speaker makes assumptions, and doesn’t know the audience. Learner never gets the opportunity to reflect and discuss. There is nothing worse than receiving training on a tool that you don’t have access to, or will never get to use. Training teachers on a product that is not in the school or district budget, and getting teachers excited about something they will never have. Trainer using outdated technology to present, or presenting on a topic that is obsolete and not needed. Ex: using a overhead projector, training on a product that is old and has replacement. One of my big ones: Not having any prizes or incentives for teachers.. Teachers LOOOVE to win prizes, and we like to snack too. Mandating that teachers attend a specific training, and never surveying them to ask what they need, or what they would like to learn. The trainer may be engaging, fun, and even entertaining, but if the topic has no relevance to you, it's still a waste of time. 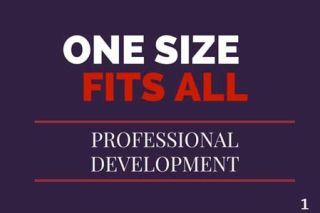 and finally, One size fits all PD- professional development that is not differentiated by content, expertise, grade level or delivery. Why is it that we constantly stress the need to differentiate learning for our students, but bundle all teachers into the same learning environment? Why are we constantly revamping educational programs but we deliver the same PD for teachers? Instead of ”professional development,” we need authentic, personalized “professional learning opportunities” that improve workflow and foster creativity. They should allow for teachers to make connections with content, and most importantly each other. Teachers need the same level of engagement as students, and they are more engaged when they participate in professional learning opportunities that give them ownership, and a personalized experience. Teachers need choice just like our students, and experiences that enhance and develop the 4C’s: critical thinking, creativity, communication and collaboration. What I have found is many teachers get overlooked and fall through the cracks just like our students, resulting in poor implementation in the classroom. Meeting this challenge is a huge task. Teachers need the opportunity to collaborate, they need to have a sense of ownership in their learning, and they need to feel valued. Their professional learning should be personalized. Most districts don’t have funding to send teachers to national conferences, or to host keynote speakers, but instead have found ways to revamp the look of Professional Learning to meet the needs of their staff in non-traditional ways. Here are few of the unique ways educators are given opportunities to expand their learning environment through creative measures. One PL strategy that seems to work well are Edcamps. based on an unconference model. these are free discussion based sessions., and they are happening all across the world. The participants create the schedule and topics by writing their ideas on sticky notes, index cards, or whiteboards. The topics are organized into sessions. You attend the session your write down, and become the facilitator by leading the conversation. Participants can use the rule of two feet, and float between different sessions depending on their needs. Saving time by emailing information ahead of time, creating videos, and online courses to disperse information. The time during PD can be spent on what matters most, tutorials and setups are sent ahead of time, so the focus of training can be on the integration and curriculum planning. Setting up accounts, logging in, and basic tutorials. Gamification relates to applying game thinking to a non-game context. Teacher execute challenges, level up and and complete competitions to earn recognition, in-house certification. Gamification can personalize learning for teachers. Prizes, Teachers can show their learner through a quiz, performance task or implementation in a lesson. Our district has created a leadership academy for teachers. this year long training model creates a small cadre of about 15 teachers that learn and work together. They connect across district grade levels and content. Other opportunities for collaboration is through cafe, tech talks and playdates. These are just informal sessions that educators can meet up to talk about whatever they want. Setting learning goals that are individualized for teachers is ideal because it puts them in charge of their professional development. Teachers can choose how they they want to meet their goal, rather it be by attending a conference, workshop, or online tutorial, or face to face. Teachers set goals, and can create PLC’s with others with similar or the same goals. Create a survey using a simple Google drive or survey monkey survey. The key to successful PD is creating professional learning experiences that support teachers to make learning faster, long-lasting and transferable. Changing the way we view professional development as a whole can certainly create impactful learning experiences for teachers, which has a domino effect in the classroom.